JERUSALEM — Prime Minister Shinzo Abe and a 100-strong delegation of Japanese government and business leaders arrived here Sunday in a visit hailed by Israeli Prime Minister Benjamin Netanyahu as part of his plan to cultivate markets in Asia as a hedge against increasing hostility in Western Europe. Abe's three-day visit is the first by a Japanese Prime Minister in nearly a decade. It will include a trip to Ramallah in the Palestine Authority and comes after three days of talks in Egypt and Jordan aimed at augmenting economic ties and stability throughout the region. But speaking to cabinet members Sunday morning prior to Abe's arrival, Netanyahu downplayed the regional character of the Japanese visit. Instead, he flagged how the visit by the leader of the third largest economy in the world "fits in with my clear vision to vary our markets." Combined with ongoing efforts to cultivate trade with China and India, Netanyahu said ties to be forged with the Abe-led delegation would advance plans to open up new markets in the East as a hedge against growing hostility in traditional Western markets. "I emphasize eastern markets not because we want to give up on other markets, but we certainly want to decrease our dependence on certain markets in Western Europe," Netanyahu said. "Certain markets in Western Europe are undergoing a wave of Islamization, anti-Semitism and anti-Zionism. These waves are washing over it and we would like to ensure that the State of Israel will have varied markets around the world." 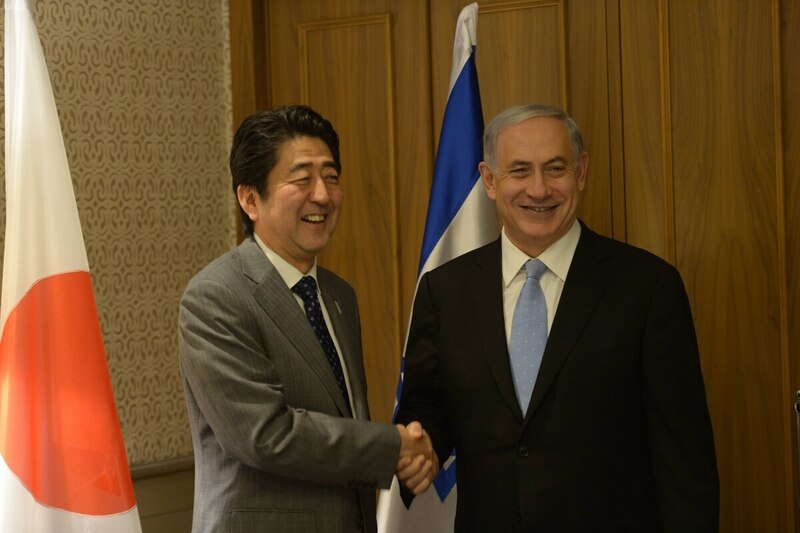 At an Israel-Japan Economic Forum Sunday evening, Netanyahu told Abe and guests that their visit here marked an historic opportunity to realize "great untapped potential" in bilateral trade, investments, joint ventures and technology exchanges. "Japan has outstanding industry, advanced science, renowned quality control, remarkable ideas and massive global reach," Netanyahu enthused. "Japan is a country of innovation; Israel is a country of innovation. Together we can do a lot more and gain a lot more," he said. Netanyahu specifically flagged his hope for cooperation in the field of cyber security, noting that Israel has attracted a disproportionate share of global cyber investment relative to its population. "Despite the fact that we're only a country of a few million people, we receive almost 10 percent, almost 10 percent of the investment in cyber security start-ups," he said. "This is a vast multiple over our relative proportion in the world's population." In a cryptic reference to preliminary talks regarding cooperation in space and dual-use remote sensing capabilities, Netanyahu said: "There are many things that we can do… The sky's the limit, and we don't need to stop in the sky. We can go higher, into higher and higher plains of cooperation." Earlier in the month, the Israeli Cabinet approved an investment plan aimed at strengthening trade ties across multiple sectors, including space- and cyber-related research and development. The plan calls for investment an unspecified "millions" of shekels over three years to foster bilateral trade ties, expand joint research grants and increase cooperation in space, cyber and information security, according to a Jan. 4 statement.